“We saw a gila monster!” This statement is occasionally heard on river trips in Grand Canyon, but what was seen is most certainly a common chuckwalla, which is in the iguana family of lizards. Although, gila monsters have been sighted in the Diamond Creek region, they are still very rare. However, chuckwallas (Sauromalus ater), or chucks as they are fondly called, are very common to see during the warmer times in Grand Canyon. They’re frequently spotted on our rafting adventures, too. 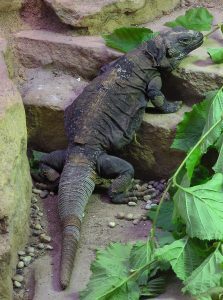 These heavy bodied, flattish, and sturdy lizards have loose folds of skin around the neck, sides and shoulders. They have thick, blunt tails and can grow up to 18 inches in length. While they can look intimidating, they are actually very shy and mild-mannered. Chuckwallas in Grand Canyon are strictly herbivores. They eat mostly leaves, buds flowers and fruit. 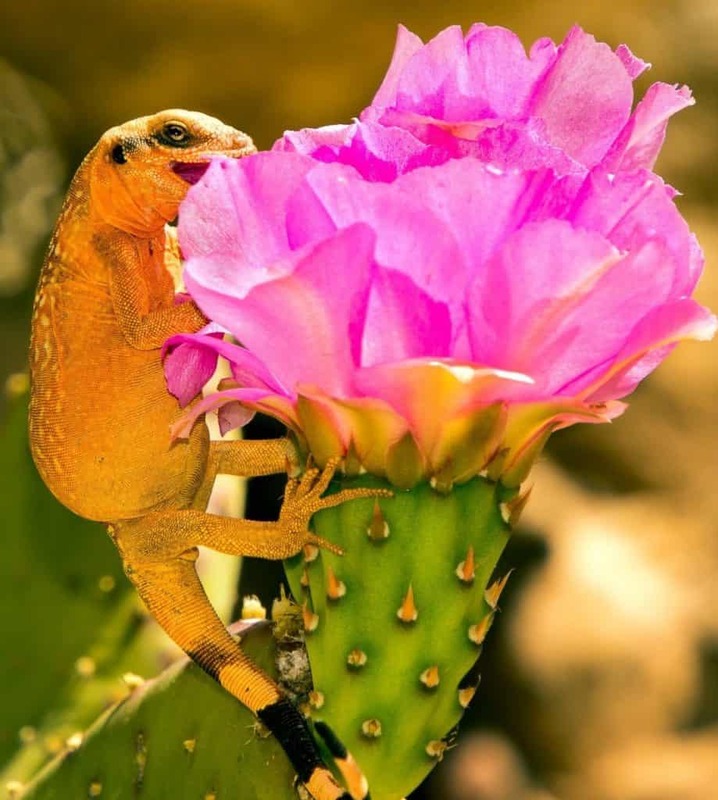 All the other lizard species found in Grand Canyon are primarily predators going after live prey. Also, chuckwallas do not need to drink water and can get all the liquid they need from their diet. Chucks are sometimes mistaken for gila monsters for two reasons: their large size , as they are the 2nd largest lizard species in North America, and the juveniles are mainly orange and black in color with stripes on the tail. 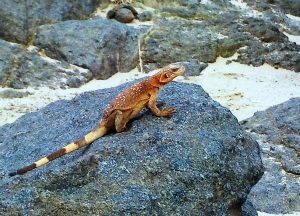 As this lizard matures, they slowly lose the orange coloration, and the striping on the tail fades, although in Grand Canyon the females may retain some tail stripes. Chuckwallas can live to over 25 years of age. Once older, the striping becomes less and less prominent on the tail. Adult males and females are different in color. Though coloring varies regionally, female chuckwallas in Grand Canyon are more solid colors of dark grey or brown. The males are more mottled and can have hints of light orange and a lighter tail. As they age, they can become whiter or yellowish, especially on their tails. Overall, mature chucks vary in pattern and coloration, and changes greatly with age. 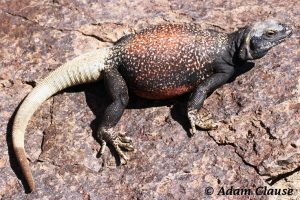 Generally adult chuckwallas in Grand Canyon are relatively dull compared to the bright orange and black juveniles. Look for chucks in areas with a fair amount of plant growth, especially areas with new leaves, buds or flowers. You can also find them near large rock piles or crevices in cliffs. As a defense mechanism, chuckwallas crawl into tight spaces and wedge themselves tightly while clinging with their claws. They then gulp in air to inflate their lungs and bellies so predators cannot pry them out. Chuckwallas are not extremely fast moving, so they will always have a safe retreat close by. Until they have reached their preferred body temperature of 100 degrees, they don’t move around too much. They spend a good deal of time warming up on hot rocks in the mornings before moving about. Because they need very warm temps to be active, you will most likely see them between May and September on sunny, hot days. Chuckwallas breed between May and June with a clutch of 5-16 eggs laid. They bury their eggs in the moist soil between late June and August. From October to March in the canyon, chuckwallas will go into brumation, a hibernation-like state that cold-blooded creatures utilize. Some early southwest tribes, and occasionally prospectors in the region, used to hunt chuckwallas. They used sharp sticks to deflate them, in order to pull them out of rocks and cracks more easily. Supposedly, chuckwallas in Grand Canyon are pretty tasty!